The Azawakh originated in the Sahel region of Africa. They have been bred by the numerous nomadic tribes of the Southern Sahara as hunting and guard dogs, as well as companions. The hound's vocations were, and still are, the chase, guarding and companionship. The nomads considered the dogs to be a show piece as well as a hunting dog. The Azawakh was recognized by the United Kennel Club on January 1, 1993. The Azawakh is a smooth coated sighthound that is very refined and high on leg. 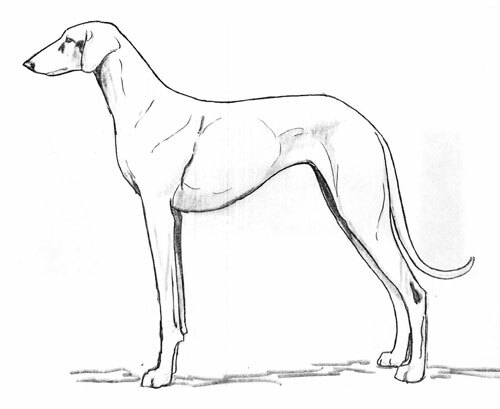 In proportion, the breed is taller than it is long. The bone structure and musculature are visible beneath very fine skin. The breed is quick and attentive. It is gentle and affectionate with people it accepts, but distant and reserved with strangers. The overall appearance of the head is long, dry, lean and chiseled. The planes of the skull and muzzle are often slightly divergent towards the front. The width of the skull is distinctly less than half the length of the total head. The skull is almost flat, and rather elongated, with no pronunciation of eyebrow or frontal groove. The occiput is clearly defined and pronounced. The stop is slight. The muzzle is long and straight, tapering towards the tip but not pointed. The cheeks are flat. The rather large, almond-shaped eyes are hazel to dark brown in color. The eyelids are fully pigmented. Disqualification: Yellow (bird of prey) eyes. The nostrils are well opened. The nose is generally either black or brown; however, nose color in the dilute colored dogs may vary. Set quite high, the fine ears are flat and droop close to the skull. They are broad at the base, and taper to a slightly rounded tip. At attention, the ears raise at the base. The neck is long, fine, muscular and slightly arched. The skin is fine, and there is no dewlap. The shoulder blades are long, lean and muscular. They are only slightly sloping when viewed from the side. The angle of the shoulder blade and upper arm is very open (approximately 130 degrees). The forelegs are long, dry and straight, with clean, fine bones. The pasterns are straight and flexible. In proportion, the Azawakh is taller than it is long by about 10%. The chest is well developed in length, but not very wide, and the brisket does not reach to the elbows, giving the breed the look of being very high on leg. The distance from the top of the withers to the bottom of the chest is less than one-half the total height at the withers. The withers are quite prominent, and the topline is straight, either level or rising slightly to the hips. The ribs are long and visible under the skin, slightly curved down to the sternum. The loin is short, lean and may be slightly arched. The hip bones are distinctly protruding, and always placed as high as, or slightly higher than, the withers. The croup is gently sloping. Fault: Hipbones placed distinctly lower than the withers. Long and lean, with straight, vertical legs. The angle of the pelvis and femur is very open (about 130 degrees). The thighs are long, and have prominent, lean muscles. The angle at the stifle is very open. The hock joint is straight, and the rear pasterns are lean. There are no dewclaws. The feet are round, with fine, close toes and pigmented pads. The low set tail is long, lean and tapers towards the tip. It has a white brush at the tip. In repose, the tail is carried low, with the tip slightly raised. When the dog is excited, the tail can be carried above the horizontal. The skin is fine and tight. The coat is short and fine, sparse to non-existent on the belly. Disqualification: Harsh or long coat. Fawn, clear sand to dark red, white, black, gray, blue, parti-color, and all shades of brown to include chocolate. With or without white markings and dark mask. Brindle, grizzle and overlays may also be present. Height ranges, measured at the withers: males, 25 to 29 inches; females 23½ to 27½ inches. Weight ranges from 44-55 pounds for males, 33-44 pounds for females. Correct movement is an essential characteristic of the breed. It must be light, supple and elastic, with high action at the trot and the walk. Over or under the prescribed height by more than one inch. Yellow (bird of prey) eyes.